The linear CCDs used in the GARRY SD series detector heads have a built-in electronic shutter facility. This allows these detectors to achieve accurate integration times down to 10 microseconds without external shutters. The detectors can be controlled via a PC with either external USB or PCI interface modules and one of our software packages. Multiple detectors can be controlled enabling simultaneous acquisition with the SAM USB interfaces. In Stand Alone operation the detector generates an analog output to an oscilloscope or external data acquisition device. This is accomplished with the optional D7259 OEM card, standalone interface board, that provides power to the detector head and allows selection of integration time between 10 us and 10s via two rotary switches. The main physical difference between the arrays is that the 3648 element array is 4.5mm longer. In some spectroscopic applications this may have an advantage. 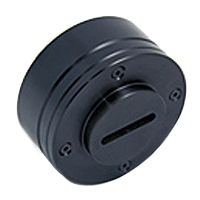 The 3000 element CCD is otherwise superior in all significant parameters and is compatible with TCDC technology, which allows correction for dark signal without having to first measure it. With the 3648 element CCD, if the dark signal is to be subtracted, then it should be measured just before the measurement cycle. This usually implies that there must be a shutter in the system or a means to block out all light from reaching the detector. These dark signal considerations are however only relevant for long integration times, when there is time for enough dark signal to accumulate in the CCD during measurement. For integration times below 10ms there is usually no need to correct for dark signal.